This page contains a number of documents in PDF format on a multitude of topics pertaining to the Minuteman missile, the Peacekeeper missile, as well as the Small ICBM missile. Some documents are technical, others are political and some are simply general interest. The author has compiled these documents over the years, and if there is something you are interested in that you do not see here, contact the author. The collection seen here is only a small number of what the author has available. One valuable resource for a number of these documents is the DTIC website, Defense Technical Information Center. Their search engine is helpful, and if you do utilize this website, be sure to try different combinations of search terms to find the topic and document you are seeking. This is a two page PDF put together by Boeing to celebrate their history with the Minuteman missile and their involvement in the ICBM program. This is an excellent 29 page PDF covering the history of the 341st Missile Wing at Malmstrom AFB, and even has material on the deactivation of the 564th Strategic Missile Squadron at Malmstrom. This is a 146 page PDF describing the changes of the Wing I QPRI and the Wing II Supplement. It discusses the changes resulting with the Wing III hardening and extending the survival period of the Launch Facility and LCF. This 52 page PDF specifies the test procedures required for the check out of equipment assembled into a Minuteman Missile System preparatory of the eventual acceptance of the Flights, Squadron and entire Wing at F.E. Warren AFB. This 169 page PDF discusses the Facilities Design Criteria for the layout, placement, configuring and wiring the various pieces of equipment in both the Launch Control Facility, the Launch Facility and Launcher Equipment Room of the WS-133B weapon system, which utilized the Sylvania system. This 361 page PDF was compiled by Boeing and was completed in June 1963. It was a report generated by monthly reports they conducted over a period of 6 months of what they discovered would be required in providing maintenance for the Minuteman Missile Weapon System, which included the LCF and LF. This is a 2 page PDF discussing the steps to be taken and the timeline laid out for eliminating the Minuteman III and Peacekeeper Launch Facilities at Malmstrom AFB and F.E. Warren AFB. This is a 247 page PDF that is the draft Environmental Assessment for removing the 50 Minuteman III missiles and 5 Missile Alert Facilities belonging to the 564th Strategic Missile Squadron at Malmstrom AFB in Montana. This is a 434 page PDF that outlines the Environmental Impact Statement regarding the removal of the 150 Minuteman II missiles at Whiteman Air Force Base in Missouri. This 221 page PDF was put together for the ICBM System Program Office to assess the environmental impacts of testing with the new Minuteman III missiles' Reentry System, in addition to continued assessment of Force Development Evaluation Flight Test at Vandenberg Air Force Base. This is a 12 page PDF exploring the history of the 321st Missile Wing at Grand Forks Air Force Base in North Dakota. This is an excellent 72 page summary of the overall history of the Minuteman missile and the various upgrades and modifications the missile has gone through throughout the years. This is a great 222 page PDF regarding the National Park Service write up about the Minuteman Missile National Historic Sight in South Dakota. There are great descriptions of the layout of a Launch Facility and Launch Control Facility and more. This 30 page PDF is a Technical Manual that provides a check list for the normal and emergency procedures for the Weapon Systems Operation Instructions manual. This 22 page PDF explores the status of the Minuteman II missile versus the Minuteman III missile, and the budgetary expenditures that would likely need to be considered, to extend the service life of the Minuteman weapon system. This is a 476 page PDF that provides a master index of all of the contractually required documents compiled by Boeing to be used by the Air Force regarding the WS-133B Weapon System. This is a 220 page PDF that discusses the Final Environmental Assessment report in the steps to be taken in removing the Launch Facilities for the Minuteman III missile assigned to the 564th SMS at Malmstrom AFB and the Peacekeeper LFs at F.E. Warren AFB. This is a 257 page PDF that is the final Environmental Assessment for removing the 50 Minuteman III missiles and 5 Missile Alert Facilities belonging to the 564th Strategic Missile Squadron at Malmstrom AFB in Montana. This is a 21 page PDF that was put together by the Missouri Natural Resources department, that explored the potent impact the deactivation of the Whiteman AFB Minuteman II missile wing would have on the area. This is a 29 page PDF that provides a comparison and evaluation of different methods proposed to satisfy Strategic Air Command's Minuteman ICBM rapid retargeting requirements. This is a 643 page PDF on the draft Environmental Impact Study that discusses the impact of placing 50 Peacekeeper missiles in Minuteman silos. This 782 page PDF discusses a variety of environmental impacts that deploying the Peacekeeper Missile at F.E. Warren AFB would cause. It discusses 13 different resource areas which include socioeconomics, public services and facilities, utilities and water resources, to name a few. This is a 169 page PDF that was compiled at the request of the Senate Committee on the Budget, which focuses on the long term costs of developing and deploying a multiple protective structure (MPS) basing system for the land based ICBM. The document explores the three missile options possible for the Multiple Protective Structure system, as well as arguing for and against implementing such a basing system for the ICBM. This is a 527 page PDF that focuses on another in depth analysis of the fiscal impact developing the Peacekeeper Missile System would have on F.E. Warren AFB and the surrounding counties the missile was deployed to. This is a 242 page PDF that discusses the Air Force proposal to construct two sections of underground tunnels on the Luke Air Force Base in Yuma County, Arizona. This construction project was designed to provide essential cost and construction data to analyze conceptual protective structures for the mobile Peacekeeper missile, also known as the MX Missile. This is a 119 page PDF that discusses a test study put together to simulate the reaction of a protective structure to ground shock and subsequent cratering, in evaluating what is called the "kill criterion" - the force created that will cause a Peacekeeper protective structure to fail. Peak overpressure on the surface has often times been thought to be the primary factor in determining the kill criterion, where this study has shown that a structure next to a crater puts it at more risk to fail. This 73 page PDF is a report that presents systems concept descriptions for sea-based MX missiles, utilizing surface ships as transporters. Floating launch methods are proposed, using either encapsulated missiles or the simple HYDRA-type vertical floating launch. This is a 440 page PDF that discusses physical modeling techniques for ICBM missiles and other protective structures. This document is the product of a session held at the Society of Civil Engineers National Convention held in Las Vegas on April 27, 1982. Prior to the convention a number of papers had been written in regards to the experimental research programs related to the development of protective structures of missiles. This documentation is a compilation of all of those papers discussed, as well as those that were not, due to time constraints. This is a 22 page PDF that reviews the overall Peacekeeper missile program, the alternative basing modes being considered for the MX missile, and the distinct strategic advantages that the Peacekeeper missile had over the Minuteman III missile, which included having a higher degree of accuracy and the ability to carry three times the number of warheads. This is a 335 page PDF put together to explore the various missile basing options possible for the Peacekeeper (MX) Missile. This 516 page PDF is one of the additional volumes of the Peacekeeper Final Jurisdictional Planning Technical Report. It proves to be some dry reading, but it definitely touches upon the complexity of what the Air Force and the government were facing, when they started the planning process of deploying the Peacekeeper (MX) Missile to the F.E. Warren AFB. This is a 62 page PDF put together by the Congressional Budget Office's requirements to establish a test program for the MX missile which was created to establish and monitor the Peacekeeper's system capability and reliability over the missile's service life. In honoring the Congressional Budget's Office mandate, the study provides an objective analysis, and does not draw upon any recommendations. This 262 page PDF was compiled to provide timely information on construction, deployment and operation of the Peacekeeper Project, including implications for the local economy, population, public services, facilities, and infrastructures within select areas influenced by the project. This 838 page PDF was created as a volume of the Final Environmental Impact Statement that includes comments and responses regarding the Draft EIS for the Peacekeeper Rail Garrison program at F.E. Warren AFB in Wyoming, including 10 candidate deployment installations; all original written comments that were received and public hearing transcripts based on 11 public hearings held on the Draft Environmental Impact Statement. This 25 page PDF compiles information on the experimental program involving construction and testing of reduced scale concrete MX missile shelters. The experiment took into account 43 shelter specimens tested under static loading conditions. Loads, deformations and reinforcement strains were measured. This 32 page PDF was a discussion regarding the MX Transporter Emplacer (TE), which at the time was the largest rubber tired vehicle in the world. It was 165.5 feet long, 29.8 feet high, 21.8 feet wide and weighed 1,450,000 pounds. This 22 page PDF discusses the Peacekeeper Rail Garrison concept that emerged during 1988 as the Department of Defense's highest priority basing mode for the MX Missile. Based on this concept, a force of 50 Peacekeeper missiles would be placed on 25 trains, each carrying 2 Peacekeeper missiles. The trains would have been parked inside train alert shelters in secure garrisons at Air Force bases throughout the U.S. This document presents the status of the Peacekeeper Rail Garrison program back in early 1989. This is a 464 page PDF that goes into comprehensive detail regarding the Environmental Impact Statement and all of the variables involved in removing the 50 Peacekeeper missiles and dismantling the Launch Facilities and Launch Control Facilities located at the Strategic Missile Squadron the MX missiles were assigned to. The EIS discusses at length the potential environmental impacts that could occur from the process of removing and dismantling the Peacekeeper and its weapon system. This is a 18 page PDF that was compiled as an executive report focusing on continued research into advanced ICBM basing technologies, deployment of Peacekeeper missiles in Minuteman Launch Facilities and the deployment of a new, small ICBM capable of mobile deployment. Once again, in deploying a new nuclear weapon system, a key component that was essential to the Air Force, was the ability to have a mobile ICBM force. The SICBM was that new weapon system. 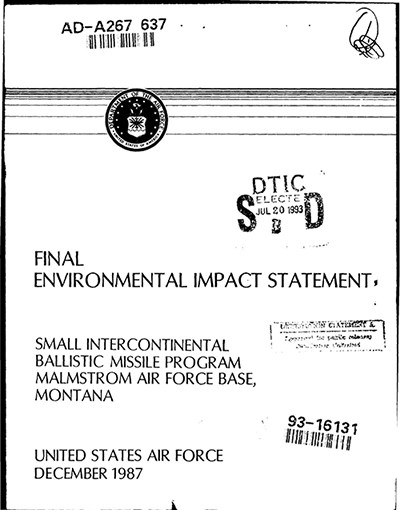 This 826 page PDF is the Final Environmental Impact Statement that examines the socioeconomic, biophysical and environmental effects expected to result from implementation of the proposed plan to deploy 200 Small ICBMs in Hard Mobile Launchers at 100 Minuteman Launch Facilities serviced by Malmstrom Air Force Base, in Montana. This 18 page PDF is an introduction to the Area Narrowing Report that summarizes the results of the Comprehensive Siting Analysis Process for the Hard Mobile Launcher in Random Movement, Hard Mobile Launcher at Minuteman Facilities, and Hard Silo in Patterned Array basing modes of the Small ICBM Missile. There are 3 separate volumes, which are available below. This 113 page PDF discusses Volume II of the Area Narrowing Report and explores the uses of the Hardened Mobile Launcher at Minuteman Launch Facilities. These launchers are the same as those used in the Random Movement concept. The survivability of the Hardened Mobile Launcher is a function of the launcher's hardness and its mobility. The mobility of the launchers, positioned at dispersed Minuteman Launch Facilities, allows them to rapidly access a large area, which provides an integral key component of mobile SICBMs; the uncertainty of the launcher's location. This 54 page PDF was an Executive Summary presented in 1991 to the Chairman, Committee On Armed Services, on the continued design and development of the ICBM Modernization put forth to counter Soviet nuclear advances. A significant national defense goal at that time had been advancing, improving and modernizing the ICBM weapon system. The Small ICBM missile was one such initiative. This is a 277 page PDF that provides the Appendix E to the Final Environmental Impact Statement regarding the proposed deployment of 200 SICBM missiles at Malmstrom Air Force Base in Montana. This Appendix was compiled to allow the commentators regarding EIS to view the overall comment responses in one volume. This 425 page PDF is the compilation of Volume I of the Narrowing Report, that focuses on the SCIBM Hard Mobile Launcher in Random Movement and goes into specific detail regarding what criteria were drawn upon in defining the advantages of utilizing the Random Movement basing mode. This is a 554 page PDF that goes into extensive discussion of Volume III of the Narrowing Report, utilizing the concept of the Hard Silo In Patterned Array system. Much like what is discussed in Volumes I and II, this volume explores the survivability of the system by using silo hardness and spacing between silos. This particular system would be deployed at one or two complexes, with a minimum of 100 missiles in any one complex. This 319 page PDF explores a significant area of ICBM Weapon System development, the mobile Intercontinental Ballistic Missile. This paper looks at the systems engineering and the powerful innovation that extended human capabilities to research, develop, operate, maintain, and sustain the complex technological systems, the ICBM. This is a 187 page PDF that provides an informative account of the challenges the military and industry faced to produce the myriad of weapons and products the Department of Defense requested during the Cold War. This 108 page PDF discusses the history of the missiles designed and deployed in the Air Force, under the structure of the Strategic Air Command. A history of SAC from 1939 to 1988 is discussed within this chronology. This 608 page PDF is an excellent report that contains the history of the U.S. Cold War missile program, technical profiles of the weapons systems, and a great deal of information describing the massive efforts that the government and Air Force went through to design, develop, construct and deploy the Intercontinental Ballistic Missile. This is a 62 page PDF that is one of a series of documents produced by the USAF Historical Division Liaison Office. Though this document does not discuss the Minuteman missile, it is an excellent read that goes into great detail regarding the evolution of the ballistic missile dating back to 1945. This document's primary focus is looking at top-level plans, policies and programs. This 75 page PDF titled USAF Ballistic Missile Fiscal Years 1964 to 1966 is one of the best documents available that explores the history of the design and development of the Minuteman weapon system and the numerous challenges faced as the Minuteman became the primary Air Force contribution to the strategic missile force. The 75 pages devoted to this document reveal excellent information regarding the Minuteman missile and the development strategies implemented as well as the obstacles encountered. This 74 page PDF titled USAF Ballistic Missile Fiscal Years 1969 to 1970 is one of the best documents available that explores the history of the design and development of the Minuteman weapon system and the numerous challenges faced as the Minuteman became the primary Air Force contribution to the strategic missile force. The 74 pages devoted to this document reveal excellent information regarding the Minuteman missile and the development strategies implemented as well as the obstacles encountered. This 32 page PDF titled "U.S. Strategic Nuclear Forces: Background, Developments, and Issues" examines the number of nuclear warheads available before the end of the Cold War, and moving forward from 1991 to July of 2009, explores the reduction of the more than 10,000 warheads deployed in the United States prior to 1991. Due to the 2002 Moscow Treaty, that number of warheads is slated to decline to 2,200 in 2012. This is a 423 page PDF that essentially was put together to tell the story of how the Air Force developed its ballistic missiles. This documents' primary focus is on the development of the Atlas and Titan missiles. This 258 page PDF is a comprehensive listing of histories, monographs, chronologies, and special studies issued by the Office of Air Force History and historical offices throughout the Air Force. This guide is essentially one comprehensive bibliography. This 33 page PDF explores one of the men selected to help fashion the technology of the post war Air Force, he was a young colonel named Bernard Schriever, who combined some uncommon personal attributes with engineering training and combat experience. Schriever was to become the officer most closely associated with the development of ballistic missiles. Schriever was responsible for the research, development, and acquisition of all new weapons used by the United States Air Force. Original - "To Defend And Deter"
This 609 page PDF is an excellent report that contains the history of the U.S. Cold War missile program. For those who enjoy the nostalgia within history, this is the original "To Defend and Deter" document, that goes into the technical profiles of the weapons systems, and a great deal of information describing the massive efforts that the government and Air Force went through to design, develop, construct and deploy the Intercontinental Ballistic Missile. This 90 page PDF titled USAF Ballistic Missile Fiscal Years 1962 to 1964 is one of the best documents available that explores the history of the design and development of the Minuteman weapon system and the numerous challenges faced as the Minuteman became the primary Air Force contribution to the strategic missile force. The 90 pages devoted to this document reveal excellent information regarding the Minuteman missile and the development strategies implemented as well as the obstacles encountered. This 89 page PDF titled USAF Ballistic Missile Fiscal Years 1967 to 1968 is one of the best documents available that explores the history of the design and development of the Minuteman weapon system and the numerous challenges faced as the Minuteman became the primary Air Force contribution to the strategic missile force. The 89 pages devoted to this document reveal excellent information regarding the Minuteman missile and the development strategies implemented as well as the obstacles encountered. This 93 page PDF titled "The Air Force And The Worldwide Military Command And Control System, 1961-1965" is a study that traces major developments in the continuing effort to provide the nation's leaders with command and control facilities for assessing and responding to crises which require, or might require, commitment of America's military forces. This 123 page PDF titled "DETERRENCE From Cold War To Long War - Lessons From Six Decades Of RAND Research" where RAND proposes that the "concept of deterrence has been somewhat neglected in the nearly two decades since the end of the Cold War." RAND states that its corporation was central to the development of modern deterrence theory and examining its more than six decades of research on the subject helps explain why deterrence is so necessary for the United States and how to improve its practice currently. This is a 2 page PDF submitted by Boeing in describing the Air Borne Laser program, its general characteristics and the history of the Ballistic Missile Defense System utilizing the high energy Chemical Oxygen Iodine Laser, (COIL). This is a 2 page PDF that comprises a Fact Sheet submitted by Orbital ATK in describing the Ground-based Midcourse Defense Boost Vehicle. The GMD System is designed to intercept and destroy hostile ballistic missiles during their midcourse phase of flight. This is a 184 page PDF that is titled "Airborne Warning And Control System Intelligent Tutoring System" that was devised to assess Air Weapons Personnel assigned to the E-3B/C Airborne Warning and Control System aircraft. One area that was studied was how the Weapons Directors (WDs) trained their Weapons Directors students, in the use of the equipment on an E-3B/C AWACS aircraft. This 2 page PDF is a Technology Requirement Worksheet outlining the necessity of establishing a Remote Visual Assessment system to provide more efficient and effective security at the remotely located Minuteman Launch Facilities. This is a 2 page PDF that defines a superhard silo as a structure designed to protect an enclosed missile from a nuclear blast at ranges larger than the inner bowl radius of the crater excavated by an attacking nuclear warhead, so that the primary destruction mechanism becomes the cratering that occurs in a nuclear blast. This document explores the characteristics essential to building a superhard silo that will withstand a nearby nuclear blast. This is a 12 page PDF that discusses how General Electric, GE, got into the business of manufacturing Reentry Vehicles for the ICBM missile force. This is an interesting read, and discusses how involved GE was in designing and deploying Reentry Vehicles for the Air Force. This is a 22 page PDF titled "The Origin Of MIRV" that discusses the development of counter force nuclear weapon capability, particularly regarding hardened ICBM Launch Facilities, which was greatly aided by the development of MIRV's - Multiple Independent Reentry Vehicles - as well as increasing missile warhead accuracy. The US deployed its first MIRVed ICBM, the Minuteman III, in 1970, and the first MIRVed SLBM, the Poseidon, in 1971. The USSR followed suit in 1975 for their ICBM and 1978 for their SLBM. This is a 335 page PDF that was compiled for the Missile Defense Agency. This document focuses on analysis of local community, airspace, health and safety, hazardous materials and hazardous waste management, air quality, noise, biological resources, cultural resources and socioeconomics. This 131 page PDF was compiled for the Missile Defense Agency. This document is a draft environmental assessment proposing an "Initial Defensive Operations Capability" in configuring four Launch Facilities at Vandenberg Air Force Base, to be used as silos for the GMD Boost Vehicles, which are designed to intercept and destroy hostile ballistic missiles during their midcourse phase of flight. This document was put together in August 2003. This 163 page PDF titled "GMD Sea Based X Band Radar Environmental Assessment" discusses the impact that using this X Band Radar would have at its Primary Support Base (PSB) at Adak Island, Alaska. The Proposed Action is configured to provide a safe, effective means of positioning the Sea Based X Band Radar (SBX) at the PSB, while also providing adequate infrastructure, security and support operations so that the SBX can maintain a high state of readiness for missile defense missions. 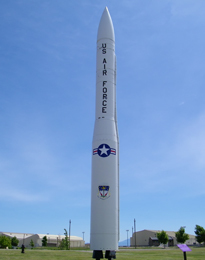 This is a 5 page PDF that addresses a long standing issue the Air Force has struggled with providing security at the widely dispersed, remotely located Minuteman Launch Facilities. In the past, the Launch Facilities did not have visual assessment capability for existing intrusion alarms. This would require that the Missile Security Response Team assess each alarm on site. A video assessment system would enhance manpower, safety and security efforts. This is a 379 page PDF that discusses a new material that came out in 1983, a slurry-infiltrated fiber concrete (SIFCON), that was brought to the attention of the Air Forces Weapons Laboratory, AFWL. A review and analysis of the SIFCON material was performed which showed the SIFCON possessed the characteristics of both high strength as well as ductility. These properties are indicative that the material had a potential use in a superhard silo structure. This 5 page PDF that explores the design and improvement of the Reentry Vehicle over the years. Aerospace was one such company that was involved in this field, and this document discusses many factors that were incorporated in the refinements and improvements of the nuclear warheads used on the Minuteman missile. As a result, much effort was devoted to Advanced Reentry Vehicles, which prompted the creation of the Air Force's Advanced Ballistic Re-Entry Systems (ABRES) group. This is a 49 page PDF created by the Congressional Research Service that examines the creation of the Reliable Replacement Warhead program, RRW, in 2005. Its purpose was part of a plan to modernize the nuclear weapons complex, and avoid nuclear testing, due to improved warhead designs that would not necessitate testing, and reduce non-deployed weapons. RRW's goal was to create replacement warheads that would be easier to manufacture and certify without testing. This is a 60 page PDF titled "Independent Review of The Department of Defense Nuclear Enterprise" and is a report that was compiled for the Secretary of Defense, Charles T. Hagel. This review came about due to a number issues that began to occur back in 2007, regarding the inappropriate handling of components of the nuclear weapon system, which falls under the responsibility of the Air Force, the Navy and the Marines. The Independent Review was tasked with visiting and listening to all of the Sailors, Airmen and Marines who perform their mission under the Nuclear Enterprise, and what steps need to be taken to strengthen the conduct of this critically important mission. This 17 page PDF titled "The Air Force's Enduring Legacy of Nuclear Deterrence" was published in the Spring 2009 "Air Power" journal. The article is well written, and worth the time reading. It states, "From the fallout of Hiroshima and Nagasaki to the global instability of the present day, the importance placed on nuclear deterrence as a pillar of national security policy has varied as a factor of fiscal reality, advanced technology, geopolitics, and national security priorities." It covers both the Air Force bomber wings, as well as the missile wings. This 177 page PDF titled "The Cold War and Beyond - Chronology of the United States Air Force 1947 to 1997" is a comprehensive listing of the numerous number of events, many historical, that the Air Force was involved with starting shortly after World War II. This is an excellent source to review the incredible number of milestones that the Air Force was directly involved in for the 50 years from 1947 to 1997. This 28 page PDF titled "The Cuban Missile Crisis: A Study Of Its Strategic Context" is an interesting read in that it presents the premise that this particular study is based on the assumption that no crisis can be understood without considering also the forces and policies which preceded and which flowed from it. It continues the premise that the crisis itself affected in turn the subsequent strategic policies of both sides and ultimately influenced the current strategic balance. This 62 page PDF titled "The Future Of Ballistic Missiles" is a report that was published in October 2003. This study comes to the conclusion that the future of ballistic missiles have enduring value, both in their traditional nuclear role and in the potential as more diversified long range precision strike platforms. This study also explores the reduction of the number of available warheads, all the while Russia continues to invest serious resources in the production of strategic weapons. This is an excellent read that gives one a great deal to contemplate in terms of the ICBM and its future. This is a 5 page PDF titled "ICBM Command and Control - History To Future" is an article that was published in the High Frontier magazine. It gives an excellent overview of the continued modernization of the ICBM missile through the years, and the importance of these major weapon systems upgrades, as well as the importance of assuring that command and control having equal and substantive improvements and modernization made as well. This is a 4 page PDF titled "Nuke Fix, Phase II" and was published in the March 2011 issue of the Air Force Magazine. This is a well written article that delves into the series of problems with nuclear weapons and components in 2006 and 2007 that lead to a renewed focus on the nuclear force and effort to correct deficiencies affecting the service's nuclear weapons arsenal.This included the activation of Air Force Global Strike Command, dedicated strictly to nuclear matters in the Air Force. This is a 6 page PDF titled "Sharpening The Nuclear Sword" and was published in the February 2013 issue of the Air Force Magazine. This article is another excellent read that examines the activation of the Air Force Global Strike Command with the goal of revitalizing the Air Force's nuclear enterprise, to ensure the USAF's two legs of the nuclear triad are a safe, secure and effective deterrent force, ready at all times. Since then, the readiness of USAF's Minuteman and nuclear bomber force has increased by 30 percent. This 124 page PDF that was compiled for Secretary Of Energy Advisory Board. The basic premise of the document examines that with the end of the Cold War, the United States ended programs to design, develop and produce new nuclear warheads and shifted its efforts to sustaining existing warheads for the indefinite future. Based on this shift in weapons development versus weapons maintenance, brings forth the questions pertaining to what is an appropriate balance between research and development and production capabilities, in addition to a number of other factors, in formulating what the future nuclear weapons complex will be. This is a 92 page PDF that was compiled for Secretary Of Defense Task Force. This report provides independent, professional advice on the Task Force's findings and the recommended improvements in Air Force organization and stewardship. The Task Force puts forth the premise that such improvements are essential both to sustain public confidence in the safety and surety of our nuclear weaponry and to bolster clear international understanding in the continuing role and credibility of the U.S. nuclear deterrent. This is a 179 page PDF titled "Silo Based ICBM Long Range Logistics Program Management Program." This plan describes the resource requirements for the Minuteman and Peacekeeper in Minuteman Silos weapons systems. This plan presents the maintenance, supportability, and improvement programs that are in place or are in the planning stage. This document was made available in April 1992. This is a 229 page PDF titled "Warhead Politics - Livermore and the Competitive System Of Nuclear Weapon Design" which presents how the United States created a two laboratory system to design, develop and test nuclear weapons. The Los Alamos National Laboratory and the Lawrence Livermore National Laboratory. Despite essentially identical missions, Livermore and Los Alamos adopted different strategies and approaches to their task, as was reflected by the number and kind of nuclear weapons each laboratory built. The study then proposes the question, why? This is a 4 page PDF titled "The Future Missile Force" and was published in the October 2003 issue of the Air Force Magazine. This article was written two years before the final deactivation of the Peacekeeper missile (in 2005) and the author discusses what the missile force will look like with the continued reduction of available Minuteman III missiles. This is a 7 page PDF titled "The ICBM Makeover" and was published in the October 2005 issue of the Air Force Magazine. This article was written two years after the article titled "The Future Missile Force" was published in 2003. This article examines how the Air Force continues to plan on how to extend the life of the Minuteman III missile, and prepare for continued, effective nuclear deterrence. This is a 5 page PDF titled "Protracted Nuclear War" and was published in the March 2008 issue of the Air Force Magazine. This article was written to hypothesize what would nuclear war truly look like. The Reagan administration asked this question, and shortly after he took office, Reagan officials started the discussion what a military campaign would consist of after a potential breakdown in nuclear deterrence. The Reagan administration took the stance that surrender was not an option, as was suicidal all-out retaliation, so some more limited, episodic nuclear doctrine was needed. This is a 5 page PDF titled "The Warhead Wars" and was published in the July 2008 issue of the Air Force Magazine. This article was compiled to review the two opposing side to the nuclear deterrence efforts. One side believes that a nuclear deterrent will be needed far into the future. They see problems with the aging warhead arsenal, and desire nuclear warheads that are rugged, safe and reliable. A weapon system that will bolster the nuclear deterrence in our future. The other side are arms control and nonproliferation advocates, religious groups, and assorted national security luminaries. This article explores which of these two opposing sides will win the latest nuclear argument.